One of the most important parts of your garage door are also the ones that are most difficult and dangerous to try and fix yourself. 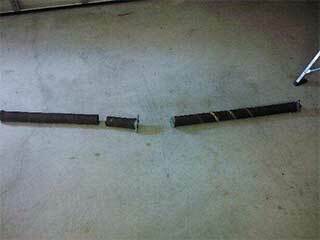 That is why it’s always important to get the job done by a team of professional technicians who are trained to handle any type of garage door spring problem. There are two types of springs that your door may be using: torsion or extension. Extension springs used to be the most commonly used type due to their cost, however torsion springs allow for safer and longer-lasting use due to their enhanced durability and flexibility, and recently they've started becoming the preferred choice. We will install the right type according your needs and the amount of backroom or headroom space available in your garage. The proper operation of your garage door is largely dependent on the function of these crucial components. Over time your current springs may need to be replaced either because they have lost their strength or because they have broken. When this is the case, it is important to hire the right team for the job. Our technicians have the years of experience and expertise required to get your door up and running again quickly and safely. In order to extend the use and functionality of your current system, your springs will need to be adjusted every so often so that they maintain the correct level of tension in order to balance your garage door properly. Another way to keep your system running correctly and safely is to have the springs lubricated which has the added bonus of reducing the loud screeching noises that they can often make. These two tasks are vital in the proper upkeep of both types of systems, and are key focus points of our regular maintenance service. Unlike other mechanical systems in your house, dealing with garage door springs should not be attempted by yourself or any of your family members. These components are under a lot of stress, which means that any wrong move can result in a serious injury. Our professionally trained technicians should be the only people trusted to safely perform any spring replacement or adjustment task. If you need someone to replace a broken spring or to make sure these components able to continue functioning for as long as possible, give Garage Door Repair Maple Valley a call today.